Wednesday, July 27 – Members of the Territory’s Search and Rescue Team (TSART) have been actively involved in the ongoing search for possible survivors of a vessel which allegedly capsized in the Territory’s waters. The team was deployed on Thursday, July 21 and Sunday, July 24 to conduct further searches in an effort to assist the sea based search operations which began on July 13 following the first report of the capsized vessel. The involvement of TSART was one of the decisions taken following the activation of the Mass Fatality Plan, during a meeting with authorities, including the Royal Virgin Islands Police Force (RVIPF), Immigration Department, BVI Health Services Authority, Ministry of Health and Social Development and the Department of Disaster Management (DDM), on July 19. 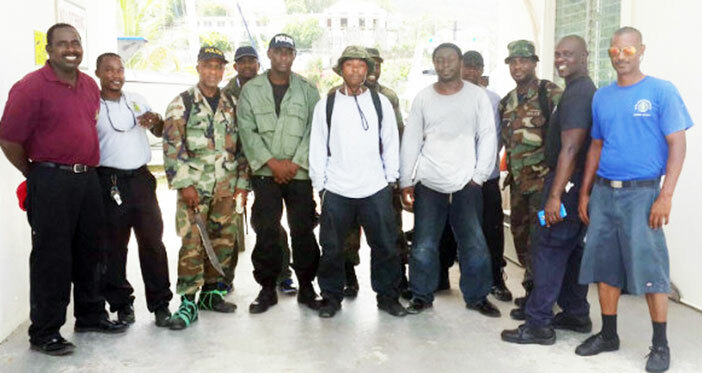 Deputy Commissioner Alwin James said, “We saw the need to continue the search operations locally and considering the mandate of TSART, a decision was made to activate the team”. He further stated, “The search operations have focused on the coastline of the southern islands in the BVI waters”. Director of the DDM, Sharleen DaBreo added, “Since the formation of the team in 2014, the members have undertaken several capacity building training exercises which have prepared them to handle this and other search and rescue operations”. The DDM has been leading the team’s capacity building efforts by ensuring that development opportunities are made available to the team and to ensure the training is in keeping with international search and rescue standards. Since this search began, the RVIPF has reported that four men were rescued by tourists in BVI waters on July 13 and were questioned by Immigration. All four men have since been repatriated. Body parts were recovered on Peter Island last week and forensic experts have begun their investigations to determine the identity of the remains. It is expected that local search operations will continue into the coming weeks and TSART will be expected to continue its operations. TSART was formed in 2014 and is comprised of 24 members from the Royal Virgin Islands Police Force (RVIPF), the Virgin Islands Fire and Rescue Service, HM Customs and the BVI Airports Authority Fire and Rescue Unit. The Team can be deployed by the RVIPF who function in the role of Incident Commander for all local emergencies that occur in the BVI or by the Director of the National Emergency Operations Center during national emergencies of disaster situations.